Also on site was Green Century Electronics Recycling collecting anything with a cord and other electronics as well as scrap metal. 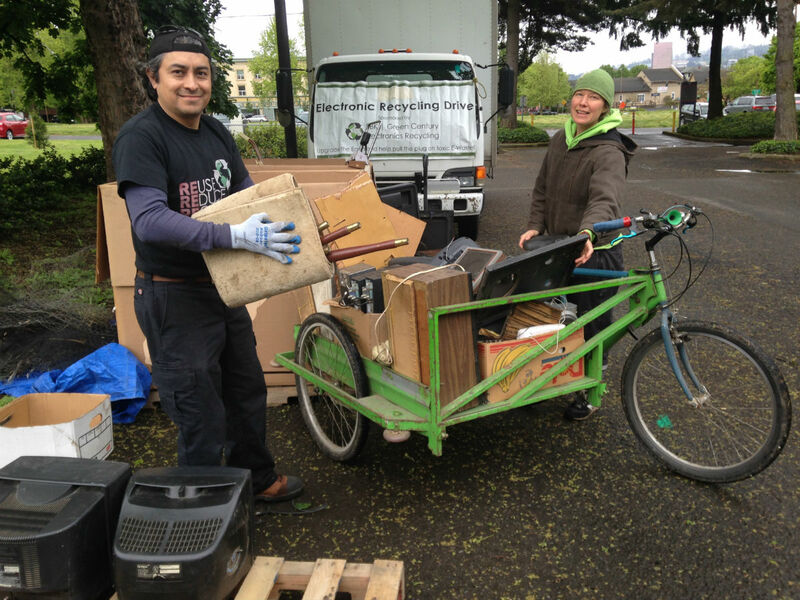 We recycled over eight hundred pounds of electronics and close to 1500 pounds of scrap metal. Way to go Eliot! We had some new volunteers this year from the Well Community Church and rumor has it they had such a good time they are putting it on their calendar for next year. Helping us again this year was the Volunteers of America’s Men’s Residential Center. They always do such a good job and can rely on them to do the heavy lifting. Also, our board members were well represented at the event too as well as some residents that answered the call for volunteers. In addition to the onsite clean up there was a walk around litter pick up. Solve was our sponsor for that portion of the event and there were seventeen additional volunteers walking through the neighborhood’s streets gathering trash. We even had one volunteer from as far away as Tigard. Stay tuned for the next walk around litter pick up perhaps this fall. Lastly, we’d like to thank Safeway, Sparky’s Pizza, Tiny’s Coffee, Portland Grip and Lighting, PICA for donating food, coffee, sand bag weights and canopies. We couldn’t do it without the help from all of our sponsors. We made close to $1000 this year from the residents’ donations which will be used to fund events and help to sponsor activities in the neighborhood. We hope to see all of the residents and volunteers again next year.